You can find all types of gifts in our Repository (Little Parish Gift Shop) - from children's books, greeting cards, candles, religious books, bibles, diaries, pictures, figurines, wallet cards, rosaries, rosary books, crosses, CDs, jewellery, Holy Communion and baby gifts to some excellent Year of Mercy books, plus much more. You're more than welcome to pop in and have a browse... It is normally opened after each mass by either Marian or Eileen. FATIMA 2015 PILGRIMAGE DVD! Click for more info. The Fatima 2015 Pilgrimage DVD is a commemorative DVD slideshow of the parish's wonderful trip to Fatima, Portugal for the feast of Our Lady of Fatima in May 2015. Experience this beautifully captured event. DVD contains 2 video slideshows and over 400 photos and costs just £10 each with the proceeds donated to Our Lady of Fatima. PARISH HISTORY BOOK - Is still available in the repository! Our beautiful Jubilee Year history of the parish and Pope John/St John XXIII School has 144 pages of wonderful reflections and stories from our various parish priests, head teachers & parishioners, packed with fantastic photographs throughout. 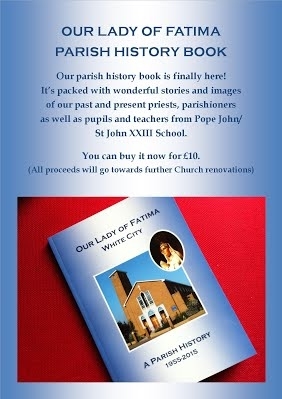 Copies are £10 each to cover costs and raise a little bit for parish funds! Our wonderful and musically talented priest, Fr Ephrem, has produced three sensational CDs of beautiful and mesmerising music with his Eritrean band. These are now available for sale for £10 each. Please ask Fr Ephrem or the presbytery (parish office) if you'd like to buy a copy.